Teacher Guide for the 36-week, 6th grade math course! All the quizzes for the course, as well as quiz answers and worksheet solutions. Cumulative reviews, final exam, and optional end of year student presentation. OVERVIEW: This course was designed to present math concepts in the context of real life so students learn to apply the rules and techniques to solving everyday problems. It will help students review and master important skills as they prepare to move into more advanced coursework. A special note about quizzes and tests included in this book: If a teacher has used the previous books in this series, he or she will be aware that they contain very few quizzes or tests. This is because they are written in such a way that students consistently demonstrate what they know. Level 6 is also written in this way, BUT because quiz and test taking is a skill that students need in life, they have been added at the end of each lesson. If you, as the teacher, do not want your student to take every single lesson quiz, simply use the lesson practice and review, which is directly before most of the quizzes. You decide what your student needs and adjust this course to fit them. FEATURES: The calendar provides daily sessions with clear objectives for the worksheets and quizzes. Made by Test Prep Books experts for test takers trying to achieve a great score on the FTCE exam. •Quick Overview: Find out what's inside this guide! •Test-Taking Strategies: Learn the best tips to help overcome your exam! •Introduction: Get a thorough breakdown of what the test is and what's on it! •Practice Questions: Practice makes perfect! •Detailed Answer Explanations: Figure out where you went wrong and how to improve! Studying can be hard. We understand. That's why we created this guide. Each section of the test has a comprehensive review created by Test Prep Books. These reviews go into detail to cover all of the FTCE test. The Test Prep Books FTCE practice test questions are followed by answer explanations. If you miss a question, it's important to understand why. That way, you can avoid missing it again in the future. The answer explanations will help you learn from your mistakes. Knowing the latest test-taking strategies is essential for the exam. A test taker has to understand the material that is being covered. They also must be familiar with test strategies. These strategies are necessary to properly use the time provided. They also help test takers complete the test without making any errors. Test Prep Books has provided the top test-taking tips. The Mometrix guide is filled with the critical information you will need in order to do well on your NYSTCE exam: the concepts, procedures, principles, and vocabulary that the New York State Education Department (NYSED) and National Evaluation Systems (NES) expects you to have mastered before sitting for your exam. Our guide is full of specific and detailed information that will be key to passing your exam. Concepts and principles aren't simply named or described in passing, but are explained in detail. The Mometrix NYSTCE study guide is laid out in a logical and organized fashion so that one section naturally flows from the one preceding it. Because it's written with an eye for both technical accuracy and accessibility, you will not have to worry about getting lost in dense academic language. Any test prep guide is only as good as its practice questions and answer explanations, and that's another area where our guide stands out. The Mometrix test prep team has provided plenty of NYSTCE practice test questions to prepare you for what to expect on the actual exam. Each answer is explained in depth, in order to make the principles and reasoning behind it crystal clear. We've helped hundreds of thousands of people pass standardized tests and achieve their education and career goals. We've done this by setting high standards for Mometrix Test Preparation guides, and our NYSTCE Assessment of Teaching Assistant Skills (ATAS) (095) Test Secrets Study Guide is no exception. It's an excellent investment in your future. Get the NYSTCE review you need to be successful on your exam. Disclaimer: Praxis® and Praxis II Middle School Mathematics® are registered trademarks of the Educational Testing Service®, which was not involved in the production of, and does not endorse, this product. Each section of the test has a comprehensive review created by Test Prep Books that goes into detail to cover all of the content likely to appear on the Praxis II Middle School Mathematics 5169 test. The Test Prep Books Praxis Middle School Math practice test questions are each followed by detailed answer explanations. If you miss a question, it's important that you are able to understand the nature of your mistake and how to avoid making it again in the future. The answer explanations will help you to learn from your mistakes and overcome them. Anyone planning to take the Praxis 5169 should take advantage of the review material, practice test questions, and test-taking strategies contained in this Test Prep Books study guide. NOTE: You are purchasing a standalone product; MyMathLab does not come packaged with this content. If you would like to purchase both the physical text and MyMathLab search for ISBN-10: 0321990595/ISBN-13: 9780321990594 . That package includes ISBN-10: 0321431308/ISBN-13: 9780321431301, ISBN-10: 0321654064/ISBN-13: 9780321654069 and ISBN-10: 0321987292//ISBN-13: 9780321987297 . A Problem Solving Approach to Mathematics for Elementary School Teachers has always reflected the content and processes set forth in today’s new state mathematics standards and the Common Core State Standards (CCSS). In the Twelfth Edition, the authors have further tightened the connections to the CCSS and made them more explicit. This text not only helps students learn the math by promoting active learning and developing skills and concepts—it also provides an invaluable reference to future teachers by including professional development features and discussions of today’s standards. Want your middle schoolers to intelligently engage with mathematical ideas? Look no further. This research-based gem brings tough Standards for Mathematical Practice 3 standards for mathematical argumentation and critical reasoning alive―all within a thoroughly explained four-part model that covers generating cases, conjecturing, justifying, and concluding. Now in paperback with extensive online video! In this video-rich edition of Adding Talk to the Equation: Discussions and Discovery in Mathematics, she invites teachers into real-life classrooms where all students stay in the game, stay motivated about learning, and ultimately deepen their understanding. This video-based resource examines the importance of creating a safe learning environment; the value of thinking, reasoning, and questioning; the role of active, accountable listening; and the necessity of giving all students a “you can do this” message. Lucy also emphasizes that slowing down, even in the face of time constraints, is crucial for creating a classroom where all students feel they have something to contribute. FUN & QUICK DAILY PRACTICE - Increase math skills and confidence with fun and quick daily practice activities! Consistent problem-solving practice at home and in the classroom boosts retention and understanding. 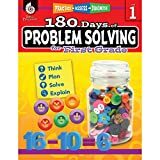 180 DAILY ACTIVITIES - Focused daily activities provide the practice students need to master all types of math problems. Students will be challenged with various types of routine and non-routine problems. As students grow up, go to college, and start their careers, they need to be able to face the “real world” and solve problems that may come their way. While this problem-solving workbook is for school-age children, it’s never too early to begin teaching how to solve problems in a reasonable, responsible manner. This lesson book can help teachers and tutors do just that. With 180 Days of Problem Solving, students get daily problem-solving practice geared directly toward developing the skills they need to approach complex problems. The activities are presented in five-day sequences focusing on First grade level skills, providing opportunities for students to think critically and approach problems using multiple strategies. Who should use this workbook? It’s perfect for the student who needs to spend a little extra time working on their problem-solving skills outside of school. 180 Days of Problem Solving provides thematic units and lesson plans that offer guidance and support for each day’s activities. This comprehensive resource builds essential critical thinking skills and connects to national and state standards. Help your students become fantastic problem-solvers so they can thrive throughout their school years and beyond.